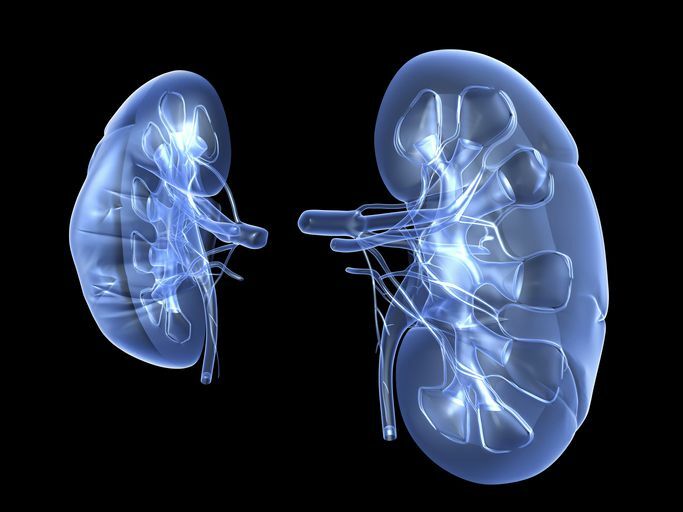 Renal tubular acidosis (RTA) is a disease that occurs when the kidneys don’t excrete acids from the body into the urine, which then makes the blood overly acidic. Having too much acid in the blood can lead to kidney stones, kidney disease, and in some cases, kidney failure. It may also affect growth, cause muscle weakness, and lead to bone disease. There are four types of RTA: distal RTA, proximal RTA, combined proximal and distal RTA, and absolute hypoaldosteronism. In children, RTA may be an inherited disorder from birth, which will remain an issue for their lifespan. In adults, RTA can be a temporary issue resulting from another disease such as diabetes, sickle cell disease, or an autoimmune condition. The primary function of the kidneys in the body is to remove waste and water, sending electrolytes like sodium, potassium, calcium, and phosphorus back through the bloodstream to circulate through the body and help organs function properly. Inside the kidneys are nephrons which have a filter called glomerulus and a tubule. The glomerulus filters blood while the tubule removes waste and returns the fluids you need back to your blood. There are approximately one million nephron units in each kidney. When one of these tubules becomes defected, it can make the entire filtration system go off track, causing kidney disease. If not treated, this also causes long-term health consequences. Certain risk factors can make someone more prone to RTA, such as diabetes, a history of urinary tract obstructions, and primary biliary cirrhosis (a chronic disease that destroys the bile ducts of the liver). Other causes depend on the type of RTA. This type occurs when there is a defect somewhere in the renal tubule, which is attached to a tiny structure in the kidney called a nephron and is responsible for secreting acid and waste into the urine. With distal RTA, the defect occurs away from the beginning of the tube and can be caused by high amounts of calcium in the blood, autoimmune diseases like lupus or Sjogren syndrome, or certain prescription medications including amphotericin B, ifosfamide, and lithium. Proximal RTA occurs when the defect is at or near the beginning of the tubule. Most commonly seen in infants, it can result from a condition called Fanconi's syndrome, which is a separate kidney tubule disorder that results in excess acid and glucose being excreted into the urine. It can also result from a vitamin D deficiency in the body or low amounts of potassium in the bloodstream. This is a combination of both types 1 and 2 RTA. However, this terminology is not regularly used by doctors as this type of RTA is extremely rare. This type occurs when the transportation of electrolytes between the organs and blood is defected, which can then lead to a buildup of electrolytes in the blood and functional issues for the organs. Certain drugs can cause type 4 RTA, including diuretics prescribed for congenital heart failure, angiotensin blood pressure drugs, the antibiotic trimethoprim, the antibiotic pentamidine, blood-clotting medicine heparin, nonsteroidal anti-inflammatory drugs (NSAIDs), and immunosuppressive drugs used to prevent rejection. Aside from certain medications, type 4 RTA can be caused by urinary tract infections or obstructions, autoimmune disorders, sickle cell disease, diabetes, or kidney transplant rejection. RTA is diagnosed primarily with a blood test and urine sample, which will test the amount of acid in each. Blood being more acidic or urine not being acidic enough are both signs that RTA may be the cause. Tests that monitor the electrolyte levels such as sodium, potassium, and chloride in the urine and potassium amounts in the blood will help doctors figure out which type of RTA is in the kidneys. No matter what type of RTA you may have, the first step is to neutralize the amount of acid in the bloodstream. This may include your doctor prescribing an alkaline medication such as potassium citrate, sodium bicarbonate, or thiazide diuretics to lower the acid level as well as changing the dosage or type of medication that is being used to treat an underlying condition that is causing RTA. If an underlying condition is producing RTA as a side effect, it’s likely that the RTA will only be completely treated once the condition itself is successfully managed. By treating RTA, the symptoms associated with it such as nephrocalcinosis, the reoccurrence of kidney stones, or bone and growth delays are also remedied with the proper attention and medical care. It’s important to get treatment for RTA as soon as it’s detected to help preserve the kidneys and prevent chronic disease. For RTA that’s caused by a congenital disorder, medication may be needed for the rest of a patient’s life. However, the right treatment can help them stay healthy and complication-free. What Causes Congenital Heart Failure? Renal Tubular Acidosis. National Institute of Diabetes and Digestive and Kidney Diseases website. Updated September 2010. Renal Tubular Acidosis. Kids Health for Nemours website. Updated March 2014. Distal renal tubular acidosis. Medline Plus website. Updated October 26, 2017. Renal Tubular Acidosis. BMJ Best Practice website. Updated January 2019.